If you're looking for a unique and ambitious blend of Cyberpunk, Steampunk, Historical, Dystopian, Sci-Fi, Fantasy madness, you have to check this out. Rees has created a fascinating premise here, and the novel more than lives up to its blurb. 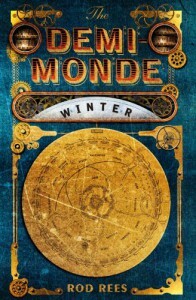 I've never read anything like this before, and I think Stephen Baxter's "Discworld's savage, noir cousin" quote is the most apt at describing what you can expect from the first novel in the Demi-Monde series. You get to explore a virtual reality filled with Historical psychopaths, what could be better?! I think, above all, a massive hats off to Rees is due here for the fact that he hasn't gone for the obvious figures, instead of the front men he's gone for the true architects behind some of the worst examples of humanity in history, giving us characters with a truly terrifying mix of prejudice, intolerance, cruelty and genius. This novel genuinely puts the "punk" into Cyber/Steampunk, by holding up a mirror to the ugliest aspects of humanity. It's both entertaining and soul destroying all at once. Obviously, with a cast of characters like this, you're due a read filled with a blend of racism and sexism that is shocking. It is, in many ways, like being hit repeatedly over the head with a mallet. It works, in its context, but there's an element of repetition that does get tiring after a few hundred pages. We get explanations of the terms used in the Demi-Monde in many different ways, and often an explanation really isn't necessary, the term and the context is enough. What you get as a reader is a blurb at the start of each chapter offering an explanation, an overt explanation in the narrative, a vocal explanation from one of the characters, and also...should you still be in any doubt, a glossary of terms at the back. It gets too much, and for me it lessened the impact of what are clever, sharp observations. The same goes for the endless Capitalisations To Make A Point. It's really not necessary. LessBienism, NuJus, HimPerialism, HerEticalism, I could go on, and on. From my perspective, if Rees had eased back a bit and given the reader a little more credit, his concepts could have had an even greater impact. But, mallets aside, it was a fascinating read. As a blend of genres it worked really well for me, and it's nice to see something so ambitious in a genre when so many writers stick steadfastly to the tried and true. This is definitely one that stands out from the crowd. It's a little frustrating in places, not least at the end! If you're not a fan of cliffhangers, you're going to be irritated. Fortunately I have the second in the series to hand so I can dig into that straight away and start looking for answers. Five stars for concept, four for execution. The Caps, the constant TLAs and the repetition knocked a star off what was otherwise a delight of a read. I stand by that review after a second read, although I'm annoyed at myself for the smug "I have the second in the series to hand" comment as, currently, I don't! I left it at Mum's, and as she lives abroad, and it's a bloody big hardback, she won't send it before we go over there next! In retrospect, I do wonder if I was harsh in knocking a star off. I struggle with the differing explanations of 'stars' between Amazon and Goodreads. I try to stick with GR as my standard, but I wish they'd let us use halves. This would be the perfect candidate for a 4.5. It's such a unique concept that it really does deserve a lot of love. I know Rees has had some bad press recently regarding some comments that many people viewed as sexist, but if I'm honest here, half the time any of my favourite authors speak outside of fiction they say something that either disappoints me or winds me up. These days I try not to pay too much attention. Is a novel well written? Does it entertain me? Does it bring something fresh to my bedside table? If someone can score three yesses there then that's really all I'm interested in. As long as they're not, murdering kittens and posting footage on YouTube or anything. Of course, there are exceptions, Harris-gate being a notable example, but in that instance the woman swore at me on Twitter so I feel perfectly within my rights to withhold any more purchases! 9 times out of 10 though? water off a duck's back. The Demi-Monde is not for the faint of heart. Brace yourself for extreme fictional racism and sexism in the company of psychopaths. You will encounter, and I quote (just to be clear!) "Anglos, Slavs, nuJus, Shades, Polaks, Krauts, Russkis, Frogs, Eyeties, Wogs, Chinks, or Nips." In a world where, again I quote! ; "Women should confine themselves to Feeding, Breeding and MenFolk Heeding." "The Demi-Monde is the most extreme and the most pernicious of dystopias." If you think you can survive it, you're in for a rare treat along the way.